Something’s been off with this Kansas team lately and chances are if you only watch SportsCenter highlights, you won’t know it. Kansas’ best player, Andrew Wiggins, gets the praise when KU wins and he gets the heat when KU loses. But you can make an argument that while Andrew Wiggins is KU’s best player, Joel Embiid is KU’s most important player. That was most evident on Monday night in Manhattan when Embiid looked off, he only played 18 minutes and it was reported after the game he is suffering from injuries. Embiid got hurt towards the end of the TCU game back on January 25th when he sprained his knee. Embiid’s injury actually looked it could have been worse on film. On Tuesday night, Bill Self discussed Embiid’s injury on his weekly radio talk show: “That thing (injury) that he had against TCU … if fans remember, we had doctors call us (after watching film) and say, ‘Well, he had to tear his ACL when he did it.’ If he wasn’t a rubber-band man, it could have easily happened,” Self said. Self then went further into describing the injury. MRIs came back to show that there’s no ligament damage. In addition to the injury he suffered on January 25th, Embiid tweaked his back at the end of the West Virginia game last Saturday. Back to my original point of writing this: without a healthy Embiid, Kansas is in trouble. 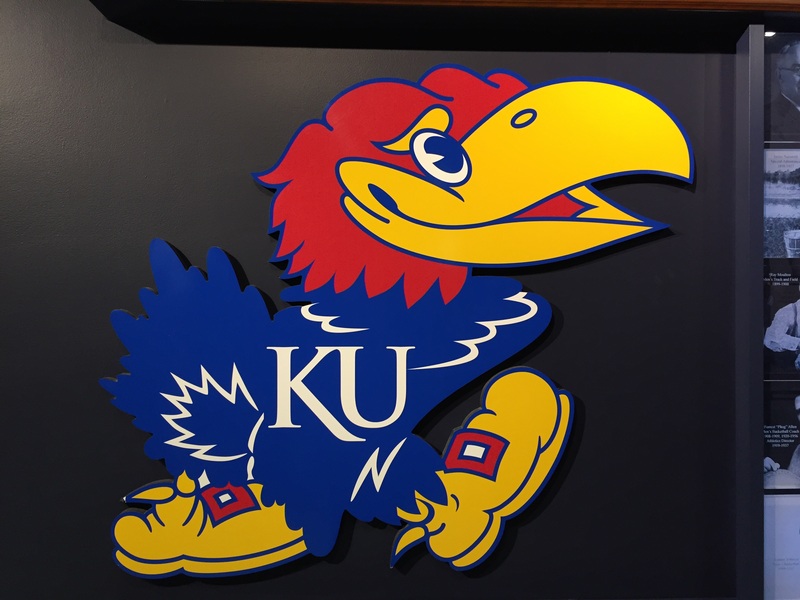 KU’s next formidable opponent is against Texas in the Fieldhouse on February 22nd. If I were Self, I’d shut Embiid down until he no longer winces when moving. Luckily for Kansas, the next two opponents: TCU and Texas Tech, aren’t that difficult and KU should be able to handle them without Joel Embiid. Embiid could sit 10 days without competition this way. After they face Texas, they also have Oklahoma at home and then head to Stillwater to face Oklahoma State (Marcus Smart will be back for that game, by the way). That three-game stretch likely will decide who wins the Big 12. Since the TCU game, Embiid hasn’t really looked the same. Yes, on paper he had a great game against Iowa State and West Virginia, but he’s only played 52 minutes in the last three games combined. That number should be alarming because before that TCU game, Embiid was playing at All-American levels. Oddly enough, the national media hasn’t really noticed his drop in numbers… mainly because of Wiggins. The biggest drop has been points per game (13.3 PPG to 8.8 PPG) and field goal percentage (68.8% to 42.4%) since his ankle injury. As you can see, his minutes have dropped from 24.6 MPG to 21.4 MPG. His blocks per game have been cut in half (3.3 BPG to 1.6 BPG). If you only take his last three games, Embiid is averaging 17.3 minutes per game and 7.5 points per game. 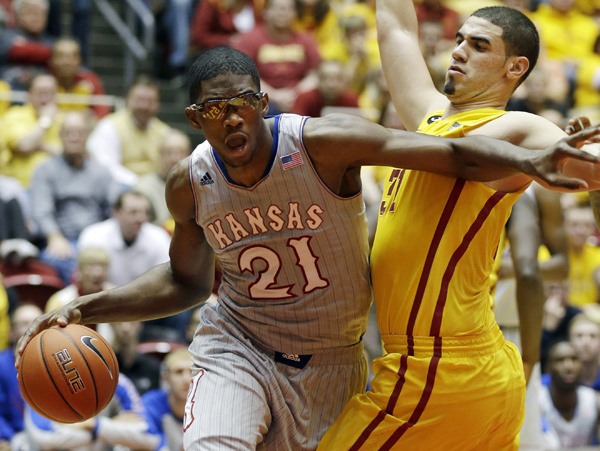 Joel Embiid is arguably KU’s second best defender, after Wiggins. 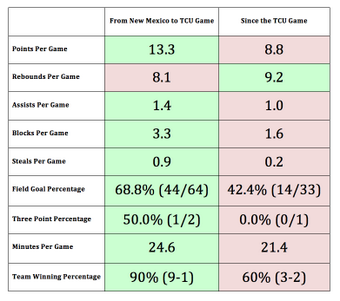 On Monday night, Kansas couldn’t stop K-State’s pick and roll offense. Guess who could have helped? Joel Embiid and his shot-blocking ability. Jamari Traylor could have helped, too, who is suspended for irresponsible behavior, whatever that is. 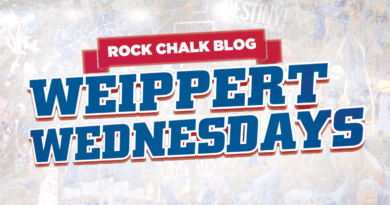 Without Traylor and Embiid, KU had no chance to stop the Wildcat’s relentless attack. I honestly believe a healthy Embiid would have won the game for the Jayhawks. Like I said before, it is crucial that Embiid is back for this KU game especially with their matchup against Texas. Even more so, Embiid is important for this KU team if they want to go farther than the first weekend in the NCAA tournament. With him, they’re a Final Four contender. Without him, KU fans are are going to have a disappointing March.